Speaking of the “people of retirement age,” the first thing that comes to mind – grandmother near the entrance, and old men playing dominoes in the park. But old age can be quite different. In this collection the story of 10 people, some of them in his 70 years look better than many 30.The compilation deliberately does not mention “stars” such as Arnold Schwarzenegger, Sylvester Stallone, Hulk Hogan and others. For many like to blame Hollywood actors, preserving good shape to old age, that they sit exclusively on plastic surgery, hormones, etc. Therefore, only athletes and ordinary people. So there you go. 01. Svetozar Nikochevich (60 Years). Montenegrin athlete giant nicknamed “Kika”. He has, as he claims, the largest in the Old Continent volume of hands, which is comparable with the model of women’s waist – 55 cm. In power sports Kika came at age 30 when, after injury had to say goodbye to football. In Podgorica, in Nikochevicha a gym, and students – to match it, for example, the famous Montenegrin kick boxer Ivan Strugar. Professional bodybuilder. Rusty started bodybuilding at age 12, and at 14 years of age has already begun to compete. At 17, the boy won his first tournament. It was the “championship of Arizona” among teenagers (Teenage Arizona). Subsequently, he won it three years in a row. Now Rusty Jeffers is a fitness instructor. He still visits the gym and keep yourself in good physical shape. 03. Andreas Kahling (62 Years). 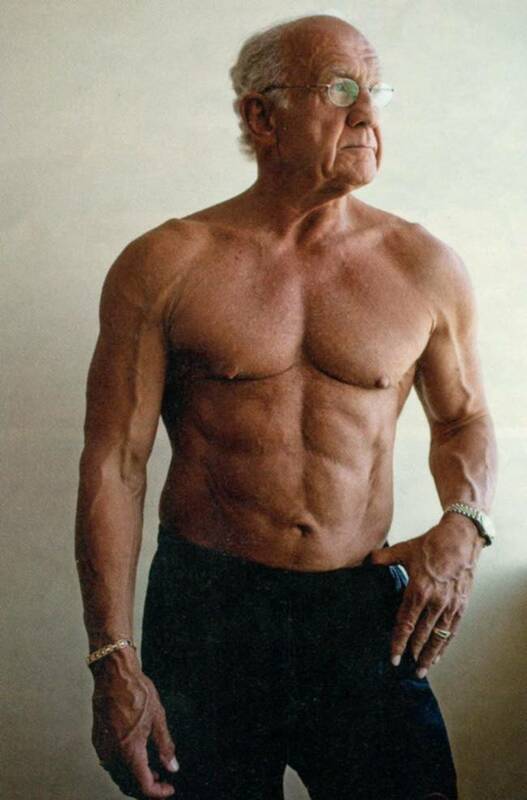 Andreas Kahling – a living monument to the outgoing “Golden Age” of bodybuilding. 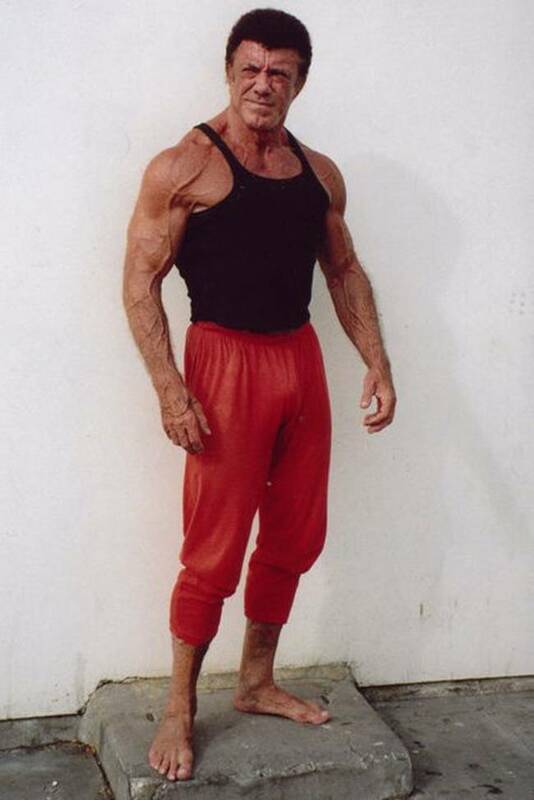 For several decades, he never misses a workout, but if you can not visit the hall – holds her home, using the method of static electricity.Curiously, Andreas Kahling many years is a staunch vegetarian, refuting the myth that without eating large doses of animal protein to achieve great success in bodybuilding is not possible. 04. Jeffrey Life (72 years). In 1997, Jeffrey Life was a family therapist. He was 59 years old, he had a weight, shortness of breath and rapidly deteriorating health. He could not even afford to tie shoelaces, without starting to choke. 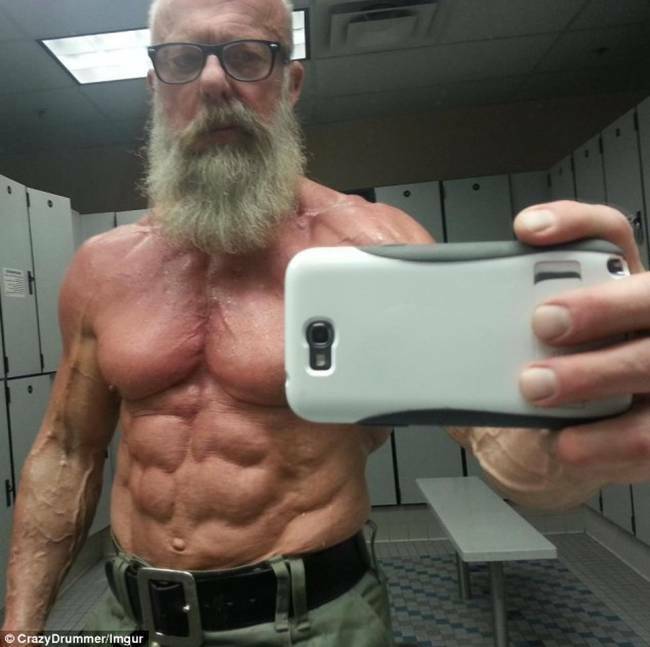 He is now 76 years old, and, according to Jeffrey, he is in the best shape of his life. He trains in the gym five days a week, has a black belt in Taekwondo and Muay Thai. 05. Valentin Dikul (51 Years). In 1962, Valentin went fifteenth year when he began to do his first issue of air gymnastics at the Sports Palace at the height of 13 meters. Suddenly burst steel beam, which carries the insurance. Valentin Dikul fell. Spent a week in intensive care city hospital, and then in the hospital neurosurgery department. Diagnosis of doctors’ compression fracture of the spine in the lumbar and traumatic brain injury, “many local fractures. 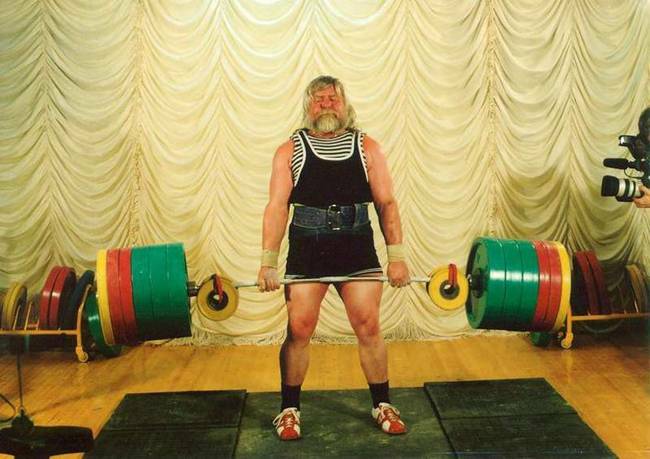 In the photo 1999 Valentin performs deadlift barbell weighing 460 kg. Then he performed a squat with a weight of 450 kg and a bench press with a barbell weighing 260 kg. With a total of 1170 kg. 06. Chet Yorton. (71 years in picture). In his youth Yorton had a car accident. The injuries were serious enough: damage to the eyeball ruptures of muscles of the forearm from elbow to wrist, hip dislocation, fractures of the hip. Doctors even seriously discussed amputation of his right leg. In the end, he was in a cast from hip to toe, with the rod inside the left thigh and the steel sheet wrapped around the right hip bone. Moreover, when he began to walk on crutches, he lost his balance and fell down the stairs, over the hip. He spent four months in a wheelchair before again resumed attempts to move on crutches. Like a natural bodybuilder, from Chet Yortona no clear differences between the competitive form and off-season. He was always in great shape and has participated in many competitions. Chet known just as a bodybuilder, having good strength gains. 07. Robbie Robinson (64 Years in picture). Since childhood, fond of sports. Competitive career is one of the most impressive. Winner of the title of Master of Olympia 1994. One of the few bodybuilders contemporaries Arnold Schwarzenegger, who to this day remain in good shape. And not only good for his age. Many of the young would envy such a relief and big muscles.This fan of bodybuilding, considering his art, such as art and architecture. 08. Spencer Churchill (74 years in picture). 09. Bill Grant (59 years in picture). Outstanding athlete, despite the fact that did not become Mr. Olympia. The track record is quite long, as his competitive career. 10. Serge Nybro (70 years in picture). 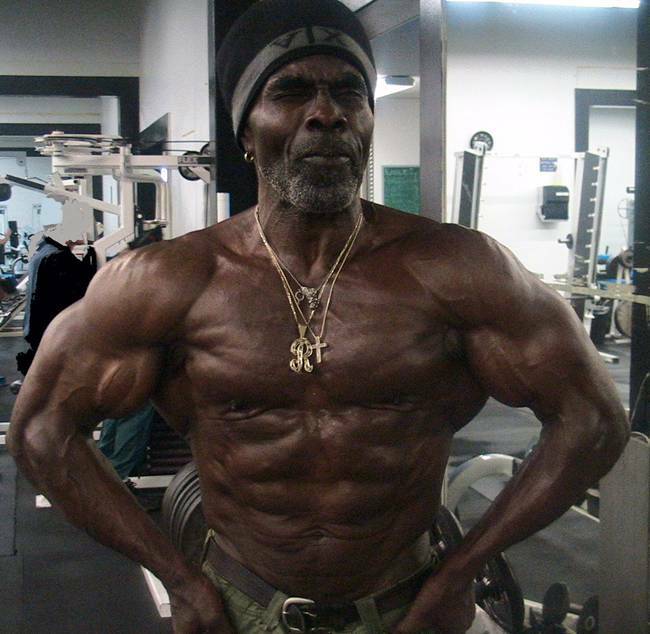 Legendary French bodybuilder nicknamed “Black Panther”, the actor and writer. 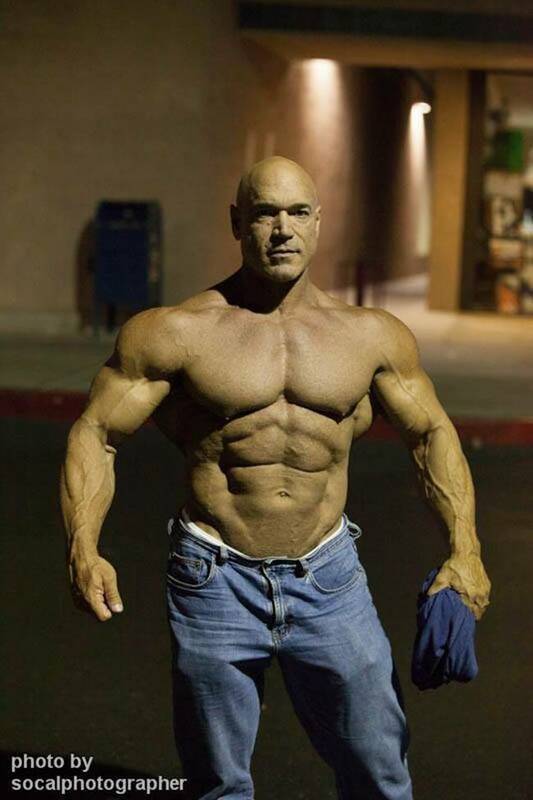 Best known for his participation in the film “Pumping Iron”, which describes events that took place around the tournament Mr. Olympia in 1975, where prizes are distributed between Arnold Schwarzenegger, Serge Nybro and Lou Ferrigno. His reflections on this event, where the legends came together just three bodybuilding Nybro outlined in his book, “I … I am God.” Incidentally, unlike the majority of bodybuilders, Nybro always continued hard training up to the speech, not giving himself no rest. Next Maggi is non vegetarian ? Hi, This is quite a nice inspiration. It would nice if Mr. Manohar Aich from India is also added to this list. He was Mr. Universe in 1952. He is now 103 years old. Still trains 90 minutes a day. There are some information on wikipedia and youtube. I’ve heard of him. Legends deserve there due. They were blessed and in turn blessed us with their magnificent presence. They deserve our gratitude. Yeah! I’ll work out ’til the day I die! amazing! 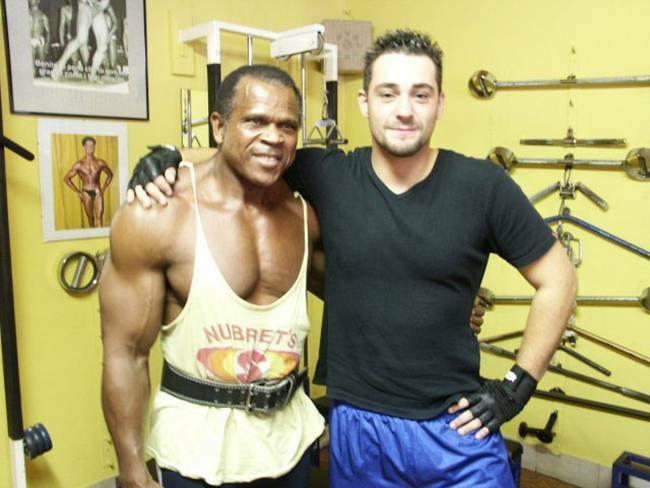 64 yr old Robinson looks so strong……same with that Montenegrin dude. Monsters in different ways, Robinson the grandmaster in his sport like Arnie. Now he looks way better than Arnie! 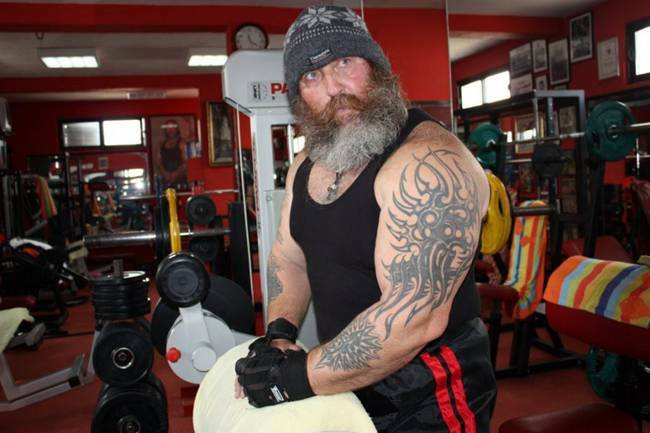 The strongman from Montenegro has retained his muscle memory and explosiveness…..He actually got stronger in his late 40’s and early fifties….big man streangth. I’d feel like a pencil neck next to those guys. Go Pops!